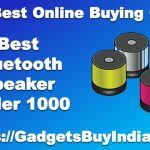 Here You Get Superb Bluetooth Speakers With High BASS. Here Is The List. So Enjoy The Clearer Sound Quality With These Bluetooth Speakers.